More than 125 neighbors and friends attended this year's picnic at Whitehaven Green Lot. Rocklands served BBQ and sides to an appreciative crowd. Guests feasted on DC’s best BBQ from Rocklands, fresh fruit, vegetables, cheeses, gelato, refreshing beverages, and hot popcorn served by Ace Glover Park Hardware. Two delicious cakes, courtesy of Lenore G. Rubino, marked Burleith’s 95th birthday. 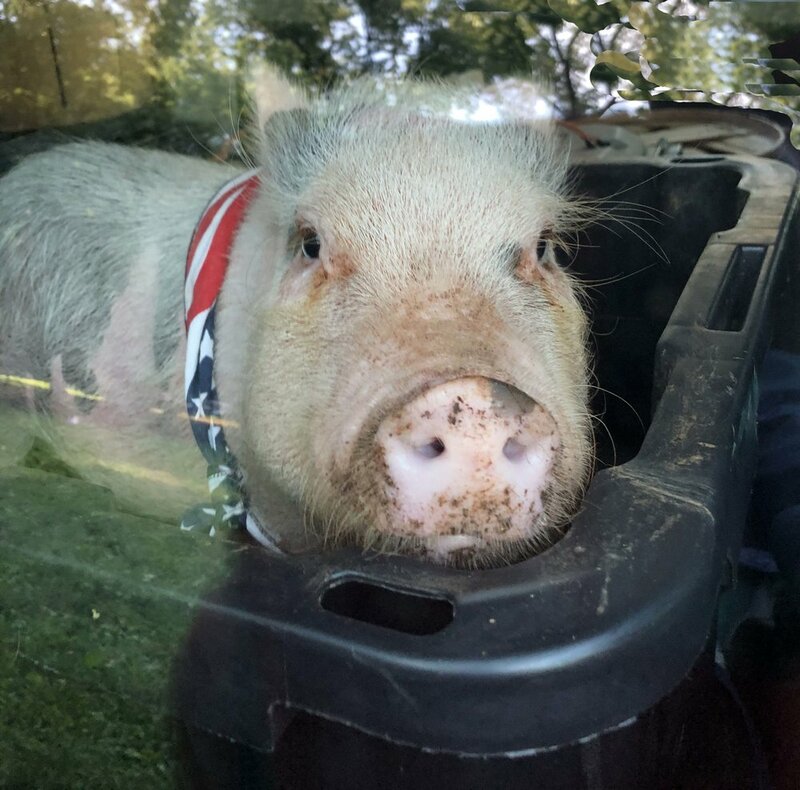 A pig, no relation to Rocklands fare, was the star attraction of Squeals on Wheels petting zoo. The Top Dog competition, GERMS ambulance, Engine 5 fire truck, petting zoo, face painter, great raffle prizes, and the smooth vibes of the Aura music duo (alumni of Duke Ellington School of the Arts) made for four hours of nonstop enjoyment. Picnic-goers also chatted with representatives of DC Clean Rivers Project, Friends of the Georgetown Library, GU Office of Neighborhood Life, and Georgetown Village to learn what they have to offer. It was pretty amazing to see the best of our community on display and the ever-growing number of young and diverse families sitting, talking, and playing together with people who’ve long called Burleith home and, just as important, our friends from nearby neighborhoods who’ve attended our special summer tradition year after year. On the political side, we were joined by DC Council chairman Phil Mendelson and ANC 2E chair Joe Gibbons. Long-time residents mingled with newer arrivals. #1: Annie, a poodle owned by Will, who sat and shook hands. #2: Hurley, a mixed breed owned by Annie (a person, not the poodle), who was recognized for his pretty sitting (aka begging) position. Our youngest guest was 1 week old. And did you notice we were greener? With compostable cups, fewer water bottles, and a more organized and visible system of recycling and trash, we started making small steps in the eco direction. Help us make bigger strides next year by emailing Francine Steininger, BCA sustainability coordinator, to get involved. 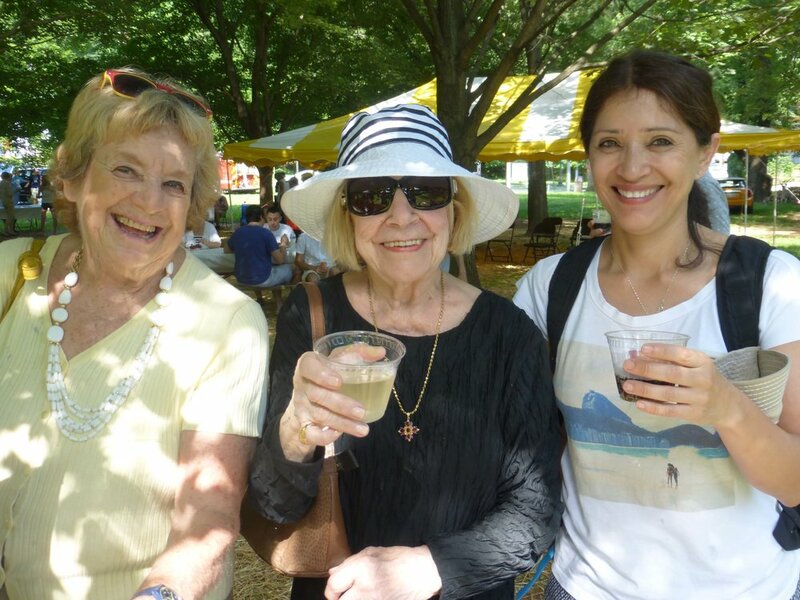 So whether you took the pre-picnic history stroll through our streets, stopped by for the first time, or have lost count of picnics past, thank you for coming, hanging for a while, and adding to essence of our neighborhood. Outreach staff from DC Clean Rivers Project distributed water bottles and answered questions about permeable alley paving. Finally, organizing the picnic is a collaborative effort. We receive generous support from neighbors, friends, and businesses, without whom our summer fun wouldn’t be possible. Liane Jones and I, along with the entire BCA Board, ask you to join us in thanking these fine sponsors and supporters. face painting by Let's make a face was a big hit. Our Business Supporters. Georgetown University, Rocklands Barbeque and Grilling Company, Lenore G. Rubino/Washington Fine Properties, Town Hall, The Salt Line, Hop, Cask & Barrel, Unleashed by Petco, Glover Park-Burleith farmers market and Community Foodworks, Yates Field House, Ace GloverPark Hardware, Palisades Veterinary Clinic, Surfside/Jettie’s, Chatter, Linda Roth Associates, Drybar, Stephen Brown, Dwane Starlin, and the Burleith Community Fund. We urge you to patronize our supporters as a way of saying thanks. Our People. Marilyn Bennett, Noe Delgado, Engine 5, GERMS, Max and Adam Langenbacher, Ed Levy, Jessica Lindeman, Cory Peterson and Cat Finnegan (GU Office of Neighborhood Life), William Holt, Devin Horne, Myra McAuliffe, Carmen Moreno, Sheila Naya, Ian Rankowitz, Annika and Ingrid Russell, Bob Stowers, May Vaughan, Erik Warga, and others who pitched in. Our community is a vibrant and special place because of neighbors like you. See you next year!